The Sunbelt conference is the hugest event in the area of Social Network and we are honored to present our project there. More than 700 abstracts are to be presented there, by social scientists, mathematicians, computer scientists, ethnologists, and more… The program is very rich and interdisciplinary and will for sure fulfill our curiosity. It’s also the best opportunity to meet researchers and practitioners interested in network visualization, looking forward speaking with you all there! 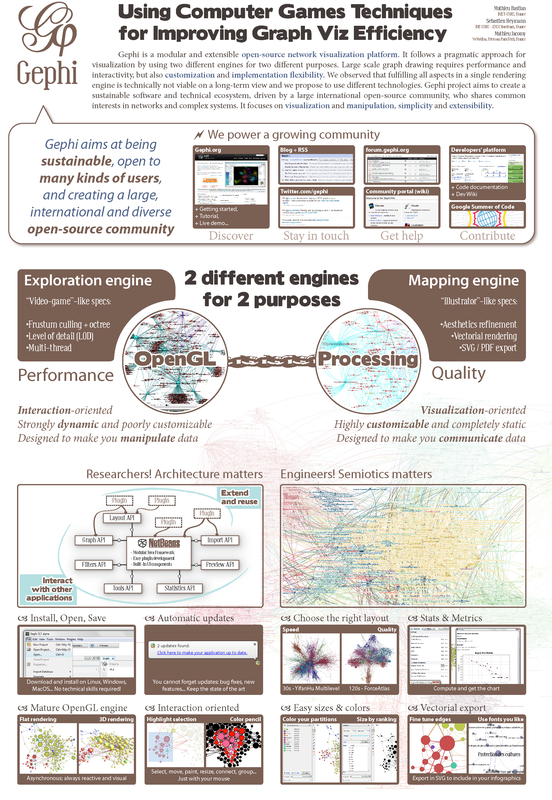 The Gephi Team presents a poster for the Eurovis 2010 conference, June 9-11, located in Bordeaux, France. EuroVis 2010 is the 12th annual Visualization Symposium jointly organized by the Eurographics Working Group on Data Visualization and the IEEE Visualization and Graphics Technical Committee. The poster will be presented by Sebastien Heymann and Mathieu Jacomy on site during the poster session. They will also provide live demo. It is a great opportunity to present some of the visualization features available in Gephi and discuss with the research community about the project and network visualization in general. The poster concentrates on the visualization topic and a general project presentation. It describes the visualization architecture built for the OpenGL and Preview engine. Gephi is a modular and extensible open-source network visualization platform. It follows a pragmatic approach for visualization by using two different engines for two different purposes. Large scale graph drawing requires performance and interactivity, but also customization and implementation flexibility. We observed that fulfilling all aspects in a single rendering engine is technically not viable on a long-term view and propose to use different technologies. Gephi project aims to create a sustainable software and technical ecosystem, driven by a large international open-source community, who shares common interests in networks and complex systems. It focuses on visualization and manipulation, simplicity and extensibility. The digital revolution and the advent of the Internet are transforming the way we work, how we spend our free time. These phenomena are also changing how we communicate with each other and the way in which we establish and maintain our social relations. The relationship between Internet and society is complex and bidirectional, leading to a co-evolution of the two systems. In fact, the Internet exists because humans need networking and the Internet evolution is ultimately driven by our ever-increasing use of it.